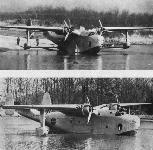 Two views of the XPBM-1 Mariner prototype with its original straight tailplane. Note the circular waist gun positions at the rear of the hull and the covered nose turret. The XPBM-1 first flew on February 18, 1939. 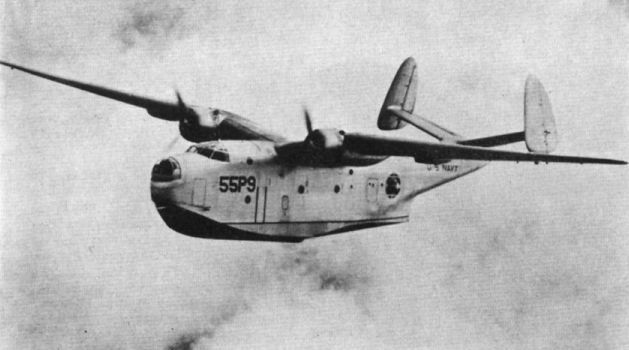 A PBM-1 Mariner of Naval Patrol Squadron VP-55 in pre-war markings and with floats retracted. A PBM-1 of Patrol Squadron VP-74 displays the retractable stabilising floats of the earlier Mariners. Twenty production PBM-1s were built. A fine wartime touchdown study of a PBM-3. This model introduced fixed strut-braced wing-tip floats in place of the earlier retractable type. Bombed-up PBM-5 84773 provides a good view of the mid-upper gun turret. A PBM-5 takes off in 1945. One of these aircraft flew non-stop for 28hr 6min during service tests. The PBM-3 above is fitted with the surface search radar installation behind the cockpit. One of the five PBM-3Bs delivered to the RAF, JX103. The type was called Mariner GR.Mk 1. An example of the PBM-3S long-range anti-submarine variant. The nose turret has been deleted. Air-sea rescue PBM-5G 84736 of the US Coast Guard. The final Mariner development was the PBM-5A, an amphibian version, of which 36 were built. PBM-5 59256 of VP-50 flying over Japan in 1956. It joined the Navy in 1945. During 1955 the Edo-designed hydroski on this PBM-5 was tested in three different positions in an attempt to reduce impact in rough-water operations.